This aerial view of the campus highlights the amount of open space preserved in the Long Range Development Plan. More than half of the university's total 1,117-acre holding, 590 acres, are designated as protected open space. Preserving open space and linking multiple sites by a greenbelt that includes the Goleta Slough, east and west Storke wetlands and the Devereux Slough are key components of the LRDP. 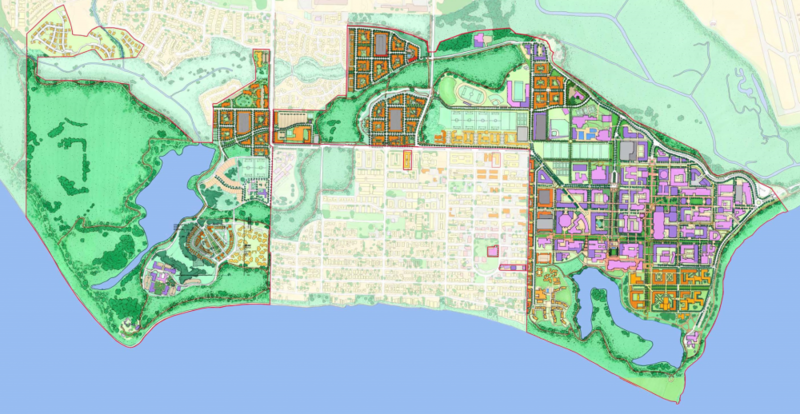 Following a thorough and collaborative public process that involved multiple agencies and stakeholders both on campus and off, UC Santa Barbara has received unanimous approval from the California Coastal Commission for its Long Range Development Plan (LRDP). The Board of Regents of the University of California, the Santa Barbara County Board of Supervisors and the Goleta City Council all previously approved the plan. A comprehensive land-use document, the LRDP will guide campus planning and development through the year 2025. “On behalf of UC Santa Barbara, I want to express my tremendous appreciation for the approval and thoughtful review by the California Coastal Commission, including Executive Director Charles Lester and his dedicated staff, whose support and wise counsel to UCSB played an integral role in this process,” said Chancellor Henry T. Yang, who attended the commission’s meeting today in Half Moon Bay. 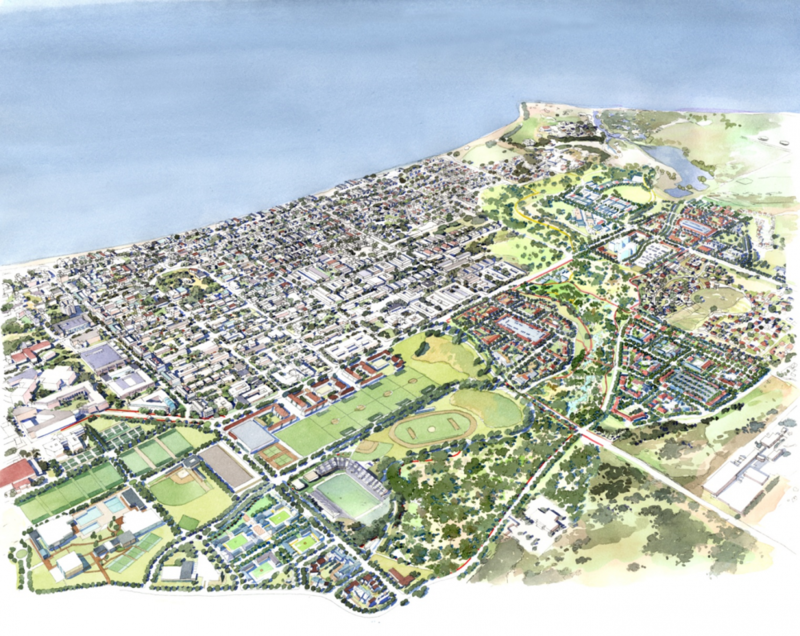 “We are extremely grateful to all who collaborated with us on UCSB’s Long Range Development Plan. The collective insight and true partnership provided by so many throughout this process have made our plan even stronger, and ensured that it is in harmony with our neighbors, the California coast and the environment. The university’s academic goals are the foundation for the LRDP, which provides a detailed road map for UCSB’s potential growth and ensures stringent environmental protections. The document outlines the physical development plan for the campus, from land use and building, to transportation and parking, to open space and landscape, to utilities and infrastructure. It is considered an essential tool as UCSB pursues its overall mission of teaching, research and public service. Besides detailing potential new academic buildings — the LRDP is a blueprint for possible projects — the plan provides for enrollment growth of up to 5,000 additional students, including 5,000 new bed spaces for undergraduates. It also features 1,800 faculty and staff housing units. Sustainability and environmental stewardship are a key component of the plan, which designates as protected open space 590 acres — more than half the university’s total 1,117-acre holding. It makes provisions for increased parking and transportation needs, including the enhancement of existing bus lines and funding an entirely new route, plus additional bike paths and stronger pedestrian connections to and from campus. Water usage, habitat restoration, plant materials and native vegetation are also addressed. The university held 65 public meetings leading up to the plan’s submittal to the California Coastal Commission, inviting and implementing an extraordinary amount of community input. As the plan was being developed, administrators, faculty, staff and student representatives met with community groups, civic leaders and elected officials –– and other UCSB constituents –– to ensure that the final plan would address community concerns while meeting campus needs.